These boots are all about protection. An internal rubber metguard, combined with a composite safety toe, provides flexible protection and increased comfort, while meeting ANSI standards. Add 400 grams of insulation, and your feet are surrounded in safety. In addition, the composite toe helps reduce cold temperature transfer. This is an excellent boot but be warned it's very bulky and big. They're nice and warm.Very well made, they look like they'll hold up for years.I normally wear an 11-1/2 but ended up needed at size 12 due to the isolation padding inside. 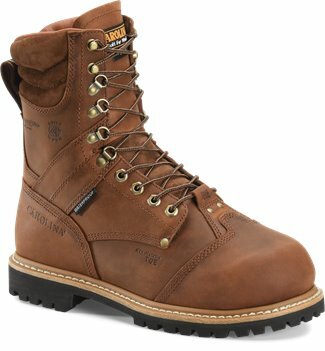 I work at a steel mill and have tried many boots including Red Wing and these Carolina Boots are by far the best that I have ever worn down at the mill. The durability and ruggedness of these boots is amazing. On average a pair of boots lasted 6 months if not shorter. These have lasted over a year and a half. I will be buying another pair. The only thing I would ask to change is to make a non insulated pair. 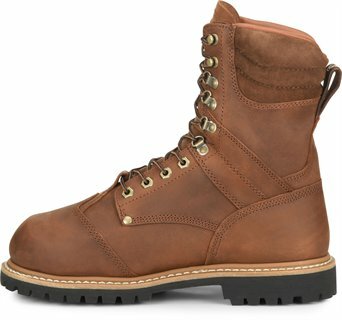 I am a big guy and these boots are by far the best I have ever bought and am going to buy a back up pair. I ordered 1/2 size bigger because of all the insulation and they fit great. I'm a welder and these boots do more protection than any other boot I have ever owned. I would not change a thing, they are perfect. Shipped really fast had them the day after I ordered them! Really warm boot feet get a lil cold on below 0 days but overall great boot!!! I had an older pair of Metaguard Carolinas that lasted me 8 years. Decided to go this way again and I am very satisfied. The only complaint I have is that where the tongue meets the boot rubs my ankle. If it didn’’t meet there they wouldn’’t be water proof and as the boot breaks in it has been going away. I am getting use to it. Great Product besides that so far.